Country’s leading business conglomerate Bashundhara Group has handed over the deed of a 50-katha plot to Bangladesh Ansar and Village Defense Party (Ansar-VDP). 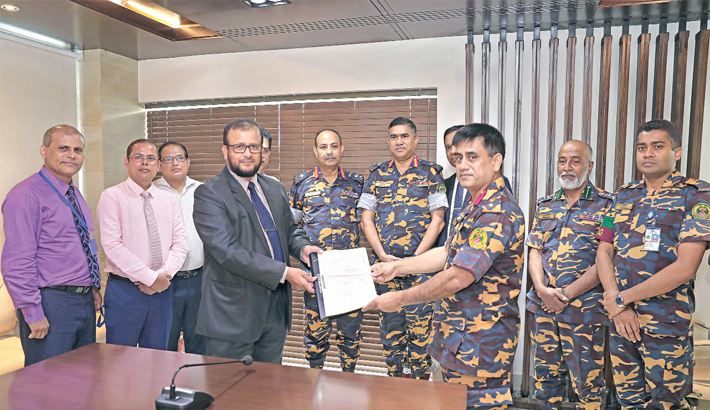 On behalf of Bashundhara Group Chairman Ahmed Akbar Sobhan, Group’s Advisor Lt Col (retd) Khandaker Abdul Wahed on Thursday handed over the deed to Ansar-VDP Assistant Director General Col Mohiddin Mohammad Jabed. Among others, Ansar-VDP outgoing chief Maj Gen Sheikh Pasha Habib Uddin, Additional Director General AKM Mijanur Rahman, Bashundhara Group’s Senior Executive Director Mohammad Liakat Hossain and Senior General Manager Mohammad Mahbubul Wadud were present at Ansar-VDP headquarters in the city. Abdul Wahed also expressed the hope that the force will continue to serve the country.